CD box containing teh first four editions of that PORK PIE cult series on three CDs - 43 songs coming up in a noble black box. 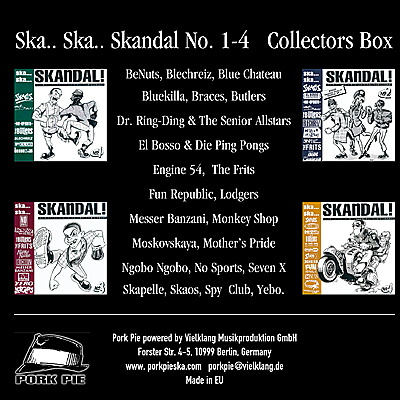 Ska.. Ska.. Skandal has written history regarding german ska music. Meanwhile, this series have enabled several generations of ska fans to experience the best and most interesting ska bands from Germany. 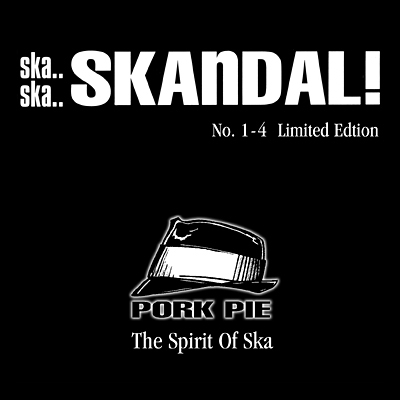 Bands like Skaos, No Sports, Dr.Ring-Ding & The Senior Allstars, The Butlers, Blechreiz or Bluekilla are responsable for the fact, that ska "Made in Germany" is now worldwide as popular as a Pork Pie hat . The SKANDAL series have been the successful debut for many well known bands. The limited vinyl edition of the SKANDAL box released in 1998 is now one of the most sought-after collectors items. The CD edition will definately be part of every serious ska record collection and will enable any ska novice to get an expert and complete overview in terms of ska music from Germany.